As Donald Trump accepts the GOP’s presidential nomination during a sometimes contentious convention, some have wondered whether he will be able to bridge the party’s primary divides by Election Day. But recent Pew Research Center studies find that while many GOP voters – especially regular churchgoers – were skeptical of Trump even as late as April 2016, well into primary season, most are now ready to support him in the general election. An analysis of Republican and Republican-leaning registered voters at three points over a roughly five month period shows that by April, Trump was the preferred nominee of just 34% of those who attend religious services weekly, including 15% who had been steady supporters (i.e., had consistently supported him across the three separate surveys in December 2015, March 2016 and April 2016). 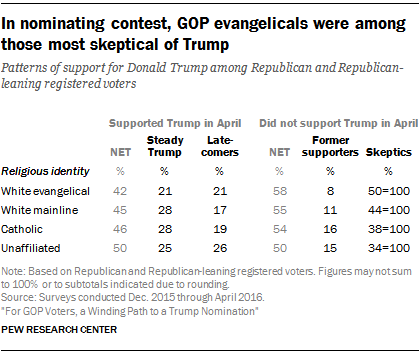 Two-thirds of regular churchgoing Republicans were not supporting Trump for the GOP nomination even in April. This includes 57% who were Trump “skeptics,” having not expressed support for Trump as the GOP nominee in any of the three surveys conducted mainly online among participants in the Pew Research Center’s American Trends Panel between December and April. 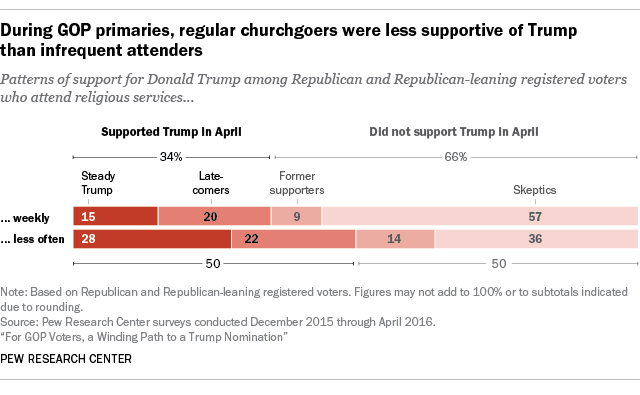 Trump received much more support during the GOP primaries from Republicans who do not attend religious services every week; half of this group was in Trump’s corner by April, including 28% who had steadily supported him throughout the primaries. Beyond church attendance, the Center’s analysis of GOP voters’ primary preferences shows that evangelicals were among those most skeptical of Trump throughout the primaries, with 50% of white evangelical Republican and Republican-leaning registered voters (and 44% of white mainline Protestants) not having backed him as the party’s nominee during primary season. More than six-in-ten Republican Catholics and religious “nones” had supported Trump at one time or another in late 2015 or early 2016. But headed into the general election, Republican evangelicals are now among Trump’s strongest supporters. 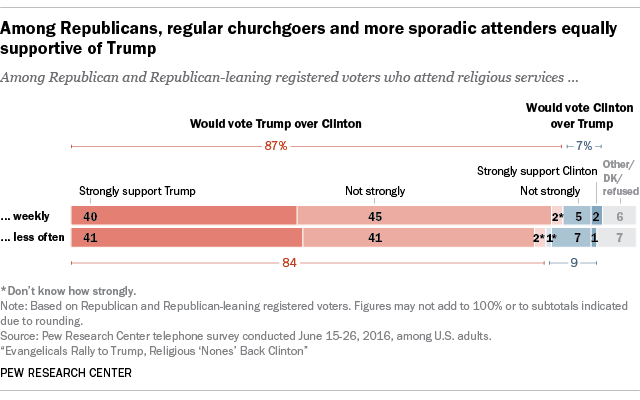 In the June telephone poll, fully 94% of GOP evangelicals say they would vote for Trump over Clinton if the election were held today, as do 88% of white mainline Protestants and 81% of Republican Catholics.